It was a strange feeling coming home after a few days back east with my family. I guess it’s always that way when you leave your new home for the first time. I was only gone for three nights but it felt like longer. It was a whirlwind trip but it was worth it. It always is. And now that it has settled in that we are permanently living across the country, these moments spent with family feel all the more precious. It’s funny how nowadays there are so many different ways to keep in touch, but nothing can even compare to those hello and goodbye hugs. That’s the real good stuff. I came home to our first ripe tomato in the garden. The only bright red one out of a very green bunch. Matt had patiently waited to pick it until I came home and we ate it last night completely au naturel. Thinly sliced and that’s it. We’ve had carrots and radishes and lots of lettuce but nothing can quite compare to our first tomato. That too, is the real good stuff. This mix of tomatoes and peaches is my new favorite summer treat. I honestly used to think that gazpacho was the strangest thing. Soup was soup and it should be hot and steamy and that’s it. But gazpacho is pretty much a revelation for me. The thing about gazpacho, you guys – is that there isn’t a moment during the day when you don’t want to eat it. It is the perfect light lunch, early dinner and mid afternoon snack. I would even eat it for breakfast. It’s cool and refreshing and tastes like summer sunshine. 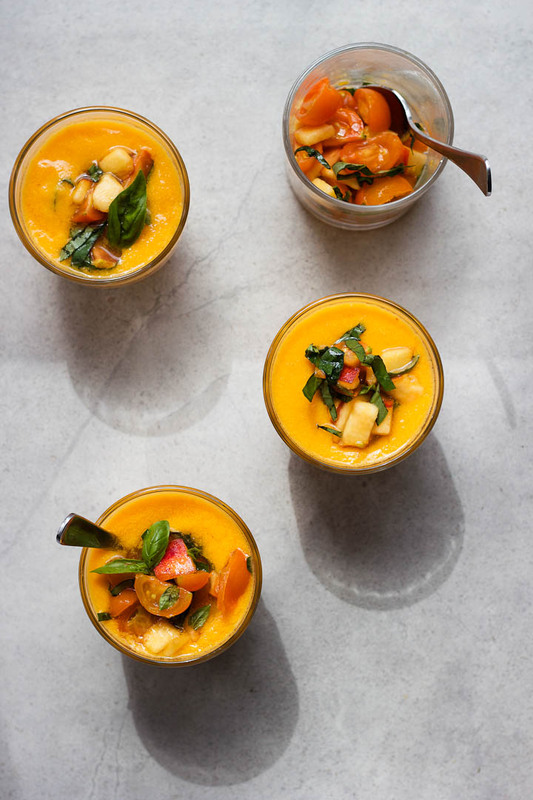 A few other golden gazpachos that have caught me eye – Lindsey’s Golden Sunflower Gazpacho, Sherrie’s Chilled Summer Soup and Shelly’s Spicy White Bean + Sweet Corn Gazpacho. I guess life is just full of the good stuff. Summer Sunshine in a glass. Or a bowl. Or a jar. Heck just with a spoon! 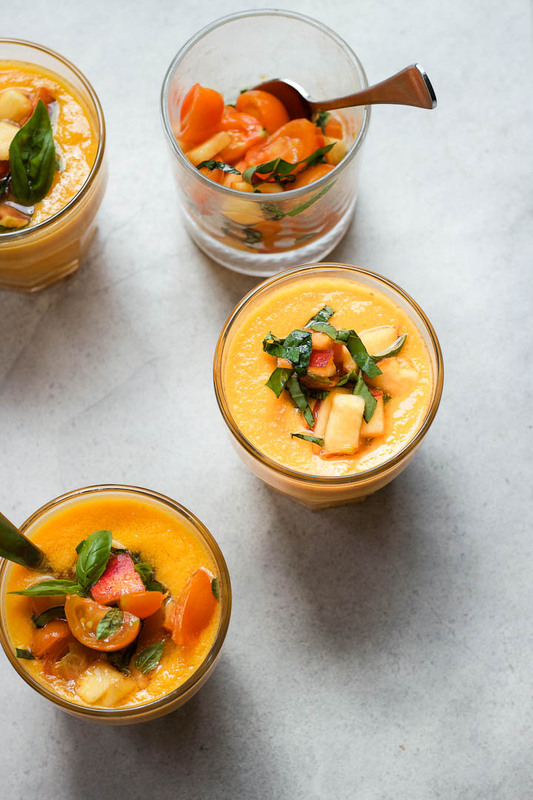 This easy summer soup takes less than 10 minutes to make and will keep you and your guest cool and refreshed. Because of the few ingredients, I will stress to seek out the best tomatoes and peaches you can find. Make sure they are ripe and juicy. Of course you can use red tomatoes here, but the yellow ones lend a little bit of extra sweetness and turn this soup into liquid gold. A few variations of the the toppings could include a sweet corn ceviche or some diced creamy avocado. The options are endless – summer really is so bountiful. This is a great make ahead meal as the chill time only improves the flavor. Vegan, gluten-free, raw and delicious – a total party pleaser! Combine chopped tomatoes, peaches and yellow pepper in a large bowl. Place garlic, shallot, salt, red wine vinegar and olive oil into a blender. Blend until garlic and shallot are well chopped. Add a few tomatoes if you need more liquid to really get things going. I do this first to ensure that the shallots and garlic get well distributed throughout the soup. Add in more tomatoes, pepper and peaches and blend until smooth. Continue adding tomatoes/peaches/pepper until everything is blended – you may need to do this in batches depending on the size/power of your blender. To get an extra smooth gazpacho – pass through a fine sieve before serving/chilling. In a small bowl, combine half a peach and a few handfuls of yellow cherry tomatoes. Add in thinly sliced basil and mix gently to combine. Serve on top of gazpacho. Gazpacho will keep in the fridge for a few days. If time allows the taste only improves as it sits in the fridge. Allow for at least half an hour of chilling, but it tastes even better the next day. Shake or re-blend quickly before serving if it looks like it has separated a little bit. The colors in this are so gorgeous! I bet it tastes even better too. Definitely will be trying it soon! YES!! Was just about to put my peaches in jars but will save a few for this beautiful soup… Thank you, happy heart!